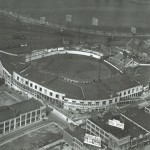 Where did the oldest continuously playing team in professional sports originate? 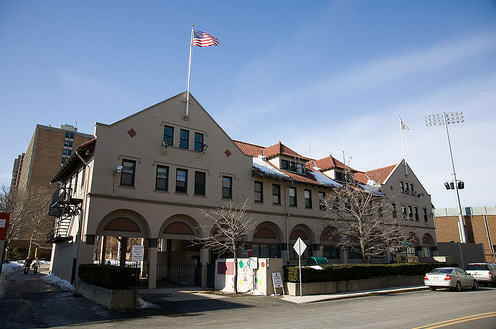 If you guessed Boston, you are correct! 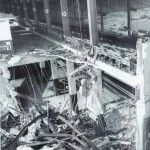 If you guessed the Boston Red Sox you are wrong! 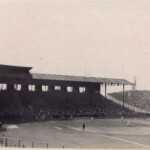 In 1871 the Boston Red Stockings were established as members of the National Association of Professional Baseball Ball Players League and began playing at South End Grounds. 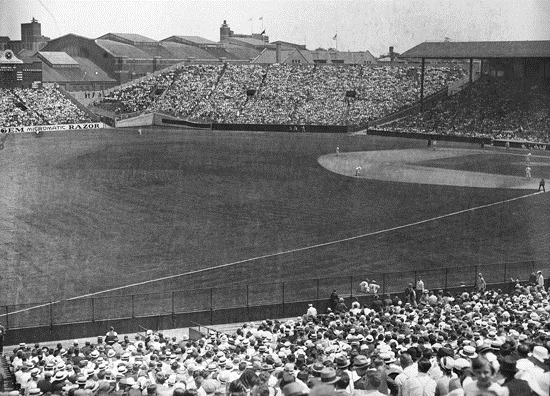 The nickname Red Stockings came from Cincinnati, where baseball’s first professional team was established in 1869 but disbanded after the 1870 season. 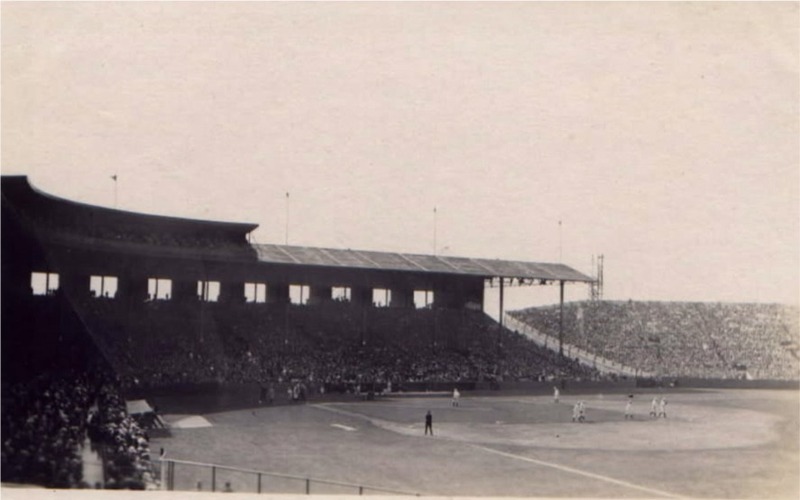 For over four decades the Boston franchise, that was known as the Red Stockings, Beaneaters, Doves and Braves played at three different ballparks named South End Grounds. 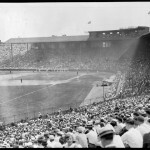 In 1901 the Boston Red Sox became charter members of the American League, giving Boston two professional baseball franchises. 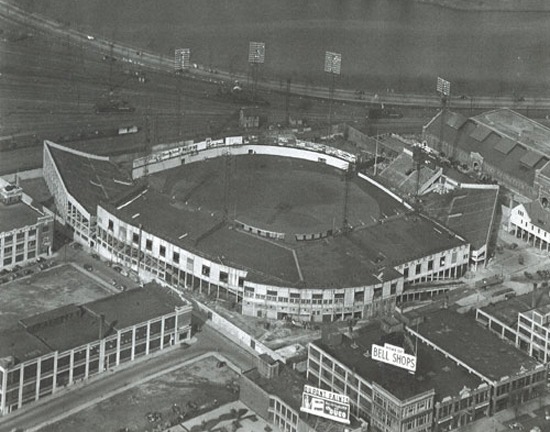 The Red Sox played at Huntington Avenue Grounds before moving into Fenway Park in 1912. 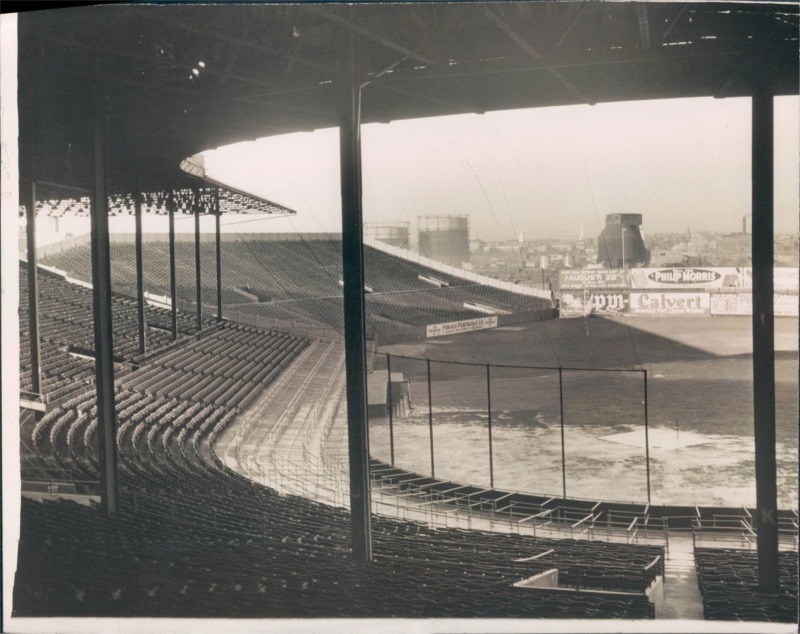 After the Red Sox opened their new ballpark, owner of the Braves, James Gaffney purchased Allston Golf Club on Commonwealth Avenue for $100,000 to construct a new steel and concrete ballpark in 1912. 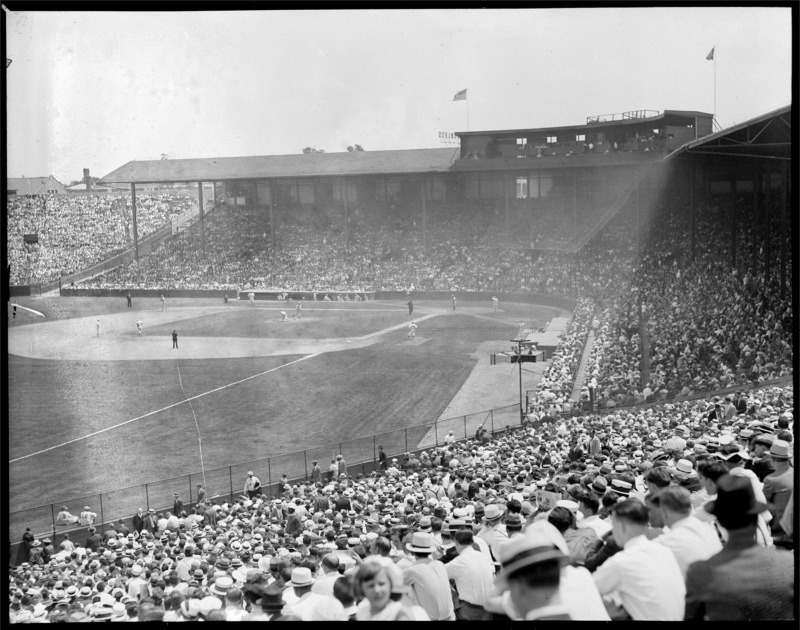 Located one mile west of Fenway Park, construction began March 20, 1915 and was completed five months later when the Braves played the St. Louis Cardinals on August 18, 1915. 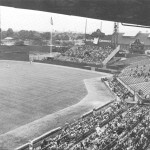 Named after the team, Braves Field was the first ballpark to seat more than 40,000 fans. 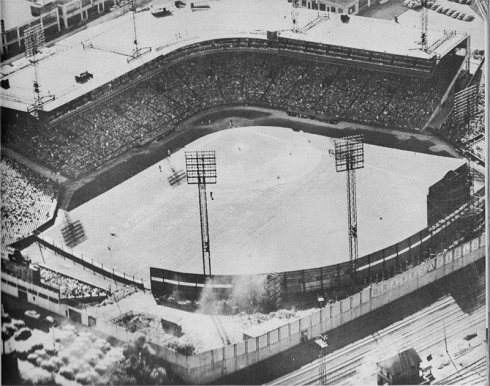 A single deck of 18,000 covered seats extended around homeplate and down both foul lines. 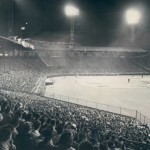 Two uncovered pavilions extended down the lines to the foul poles, each holding 10,000 fans. 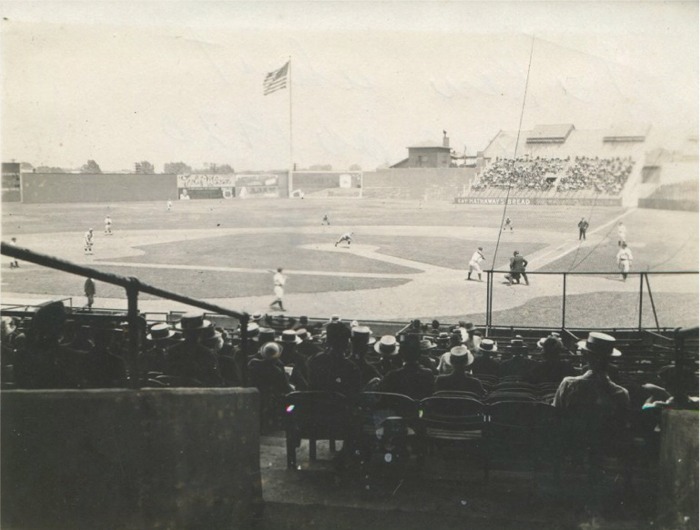 In right field was a section of bleachers that seated 2,000 fans and was nicknamed “The Jury Box” after a sportswriter noticed only 12 fans sitting here during a game in 1918. 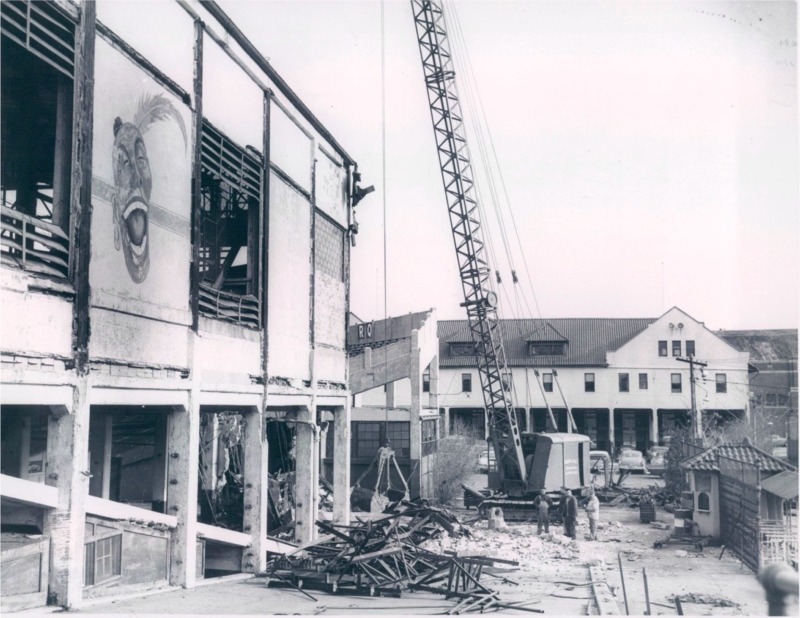 The scoreboard was located above these seats. 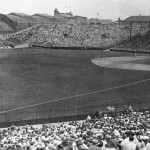 Unassisted triple play by Ernest Padgett on October 6, 1923. 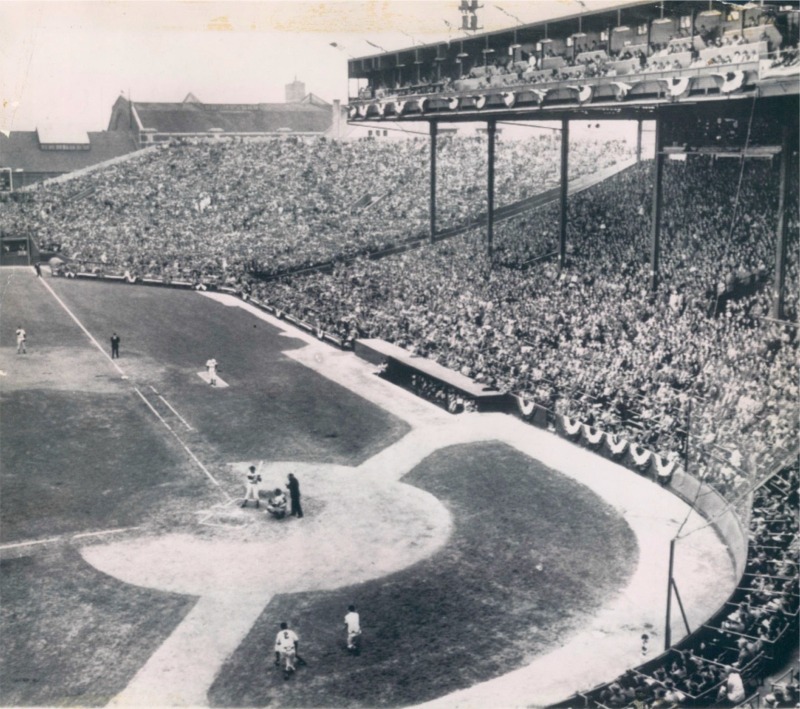 3,000th hit by Paul Waner on June 19, 1942. 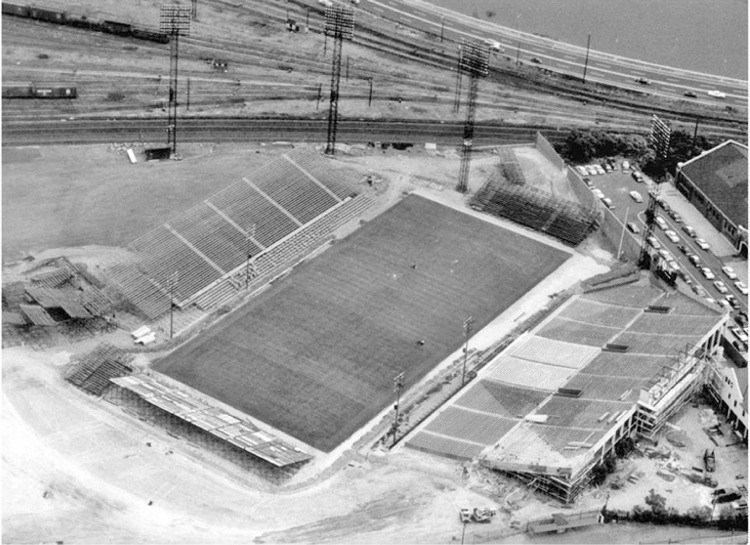 Four-time 20 game winner Johnny Sain. 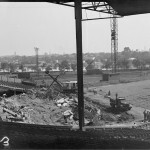 Tommy Holmes hits in 37 straight games in 1947. 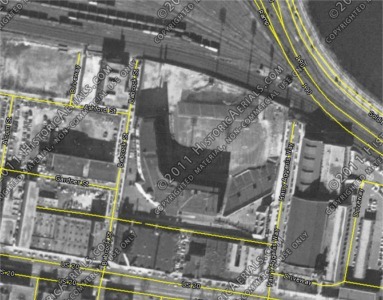 Original dimensions at Braves Field were 402 ft. (left), 550 ft. (center), and 402 ft. (right) leading to many inside the park homeruns. 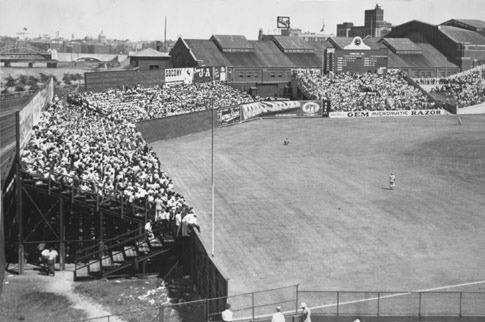 The field was surrounded by a 10 foot wall. 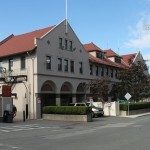 Behind this wall were the tracks of the Boston and Albany Railroad. 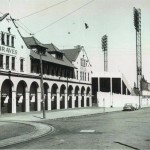 Outside the right field wall was one of Braves Field’s most iconic structures, the team’s ticket and executive offices that featured a facade of Spanish colonial and stucco with a red tile roof. 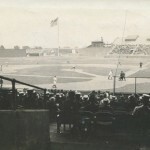 Throughout the 1920s fans became more interested in seeing homeruns than a pitching matchup or inside the park homerun. 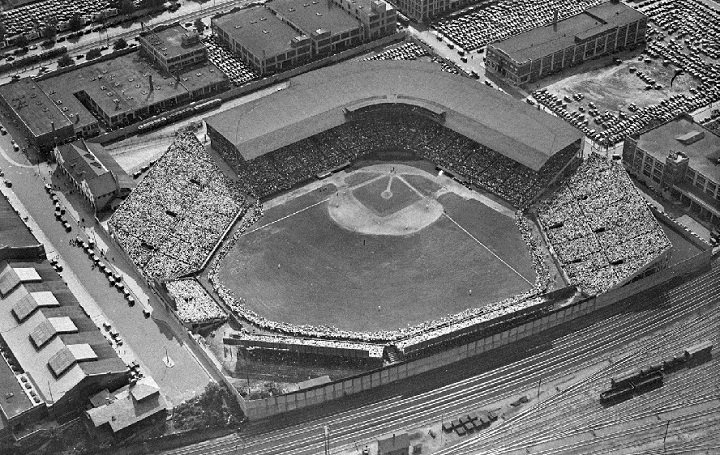 This led the Braves to adding 6,000 seats in left and center field, shortening the dimensions of the ballpark to 353 ft. in left field and 387 ft. in centerfield. 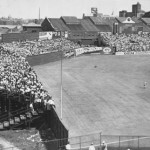 However this changed helped opposing teams more leading the team to push back the outfield fence. 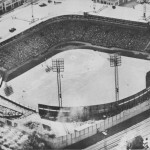 In 1936, the Braves were renamed the Bees and Braves Field was renamed National League Park. 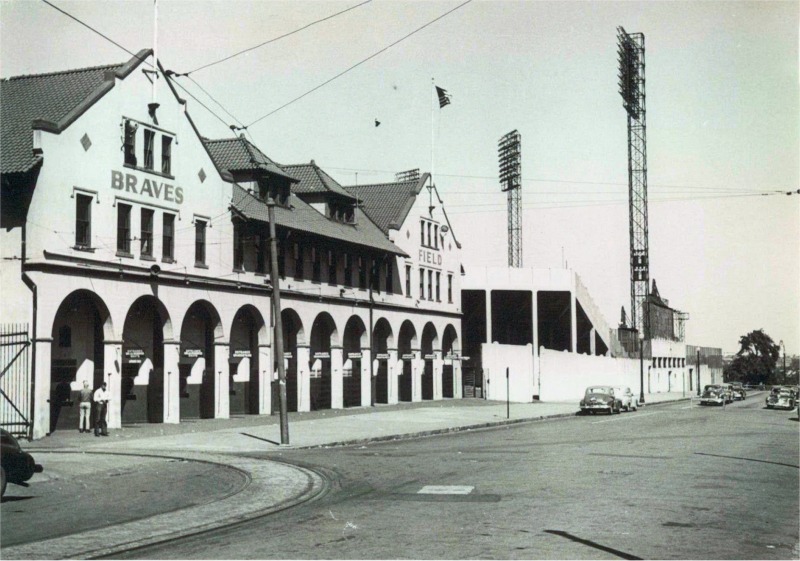 The Bees nickname last only several seasons before being changed back to the Braves in 1941. 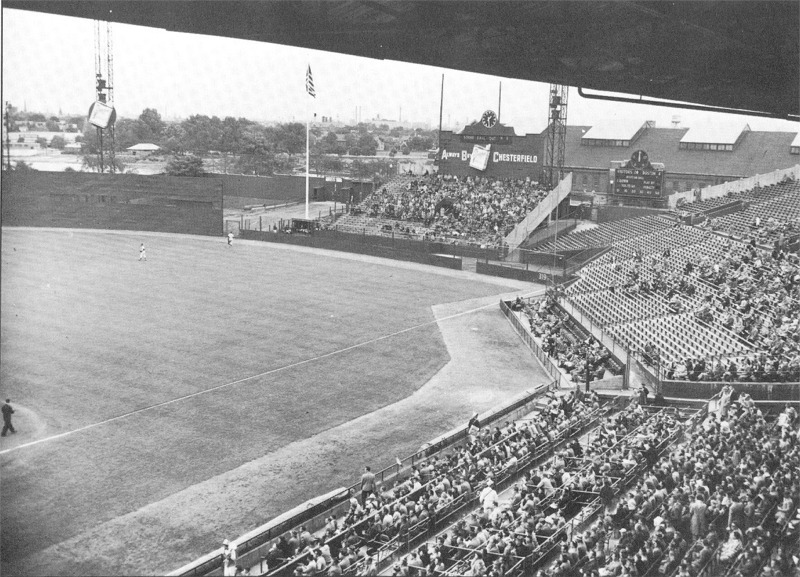 During the 1940s fir trees were planted behind the centerfield fence to hide the smoke from the nearby rail yard. 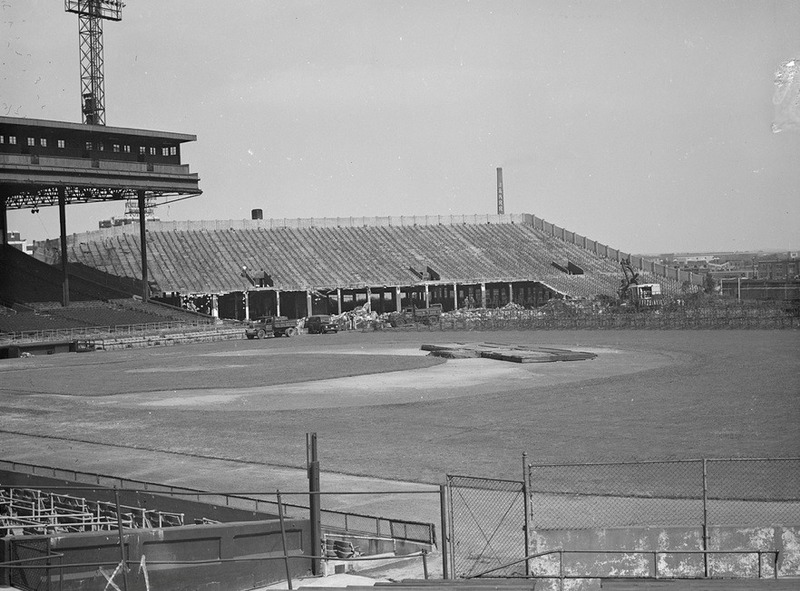 Before the start of the 1946 season, $500,000 was spent upgrading Braves Field. 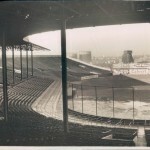 Lights were installed and the dimensions of the field was moved in with the addition of an eight foot high outfield wall. 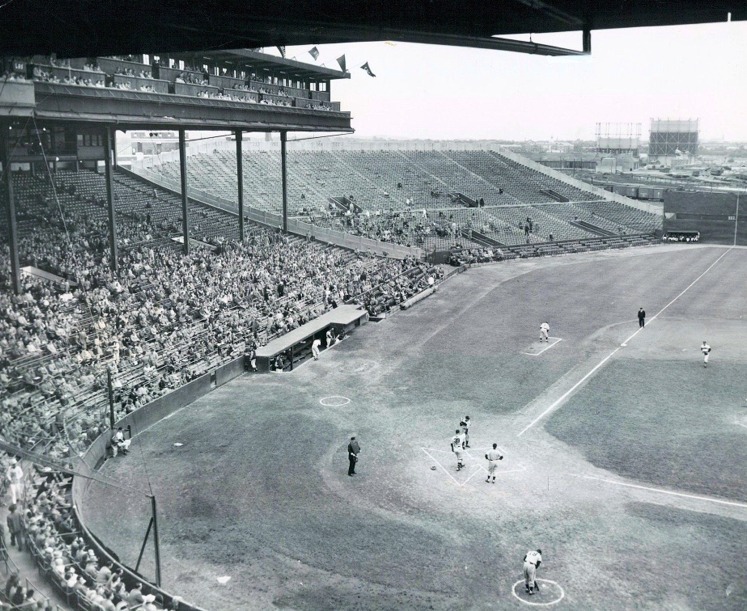 On opening day 1946, fans went home with green clothes because the seats had been painted, but had not dried. 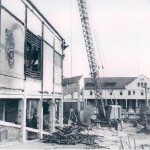 A new 68 foot scoreboard was added in 1948. 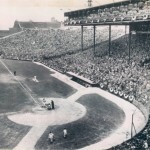 In 1946 the Braves attracted one million fans for the first time in history and two years later the team won the National League pennant for the first time since moving into Braves Field. 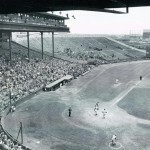 However by the early 1950s attendance decreased dramatically as the Braves struggled on the field. 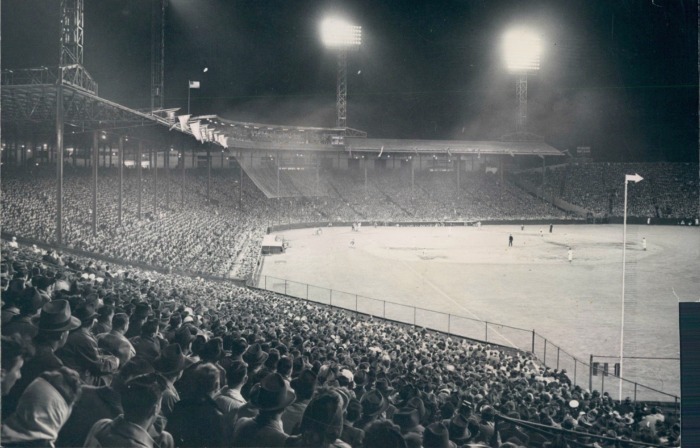 Unaware to fans in Boston, the Braves played their last game at Braves Field on September 21, 1952, losing to the Brooklyn Dodgers. 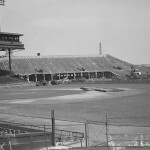 Just weeks before the start of the 1953 season, owner of the Braves, Lou Perini, announced that the club was moving to Milwaukee and their new stadium, County Stadium. 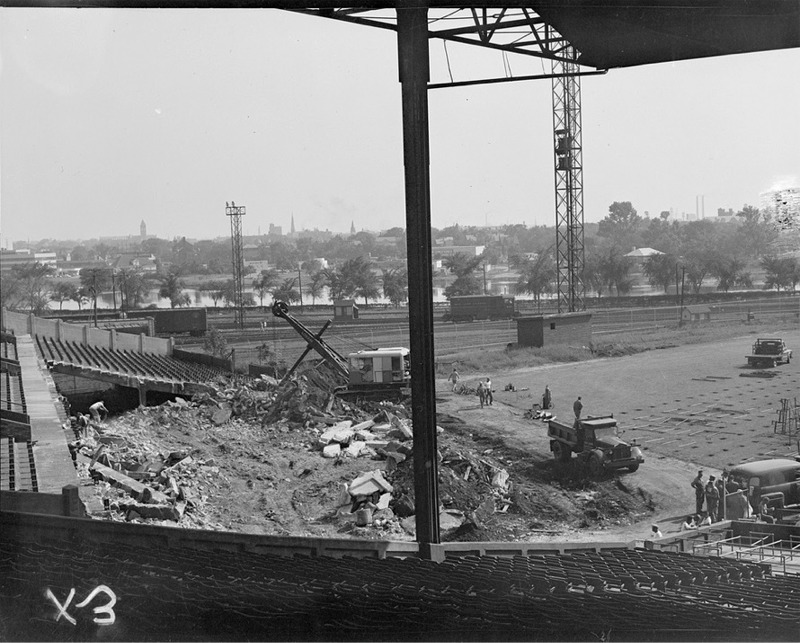 Braves Field never housed baseball again, but parts of the facility remain today. 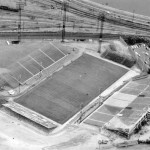 In 1953 Boston University purchased the stadium and converted it into a football field. 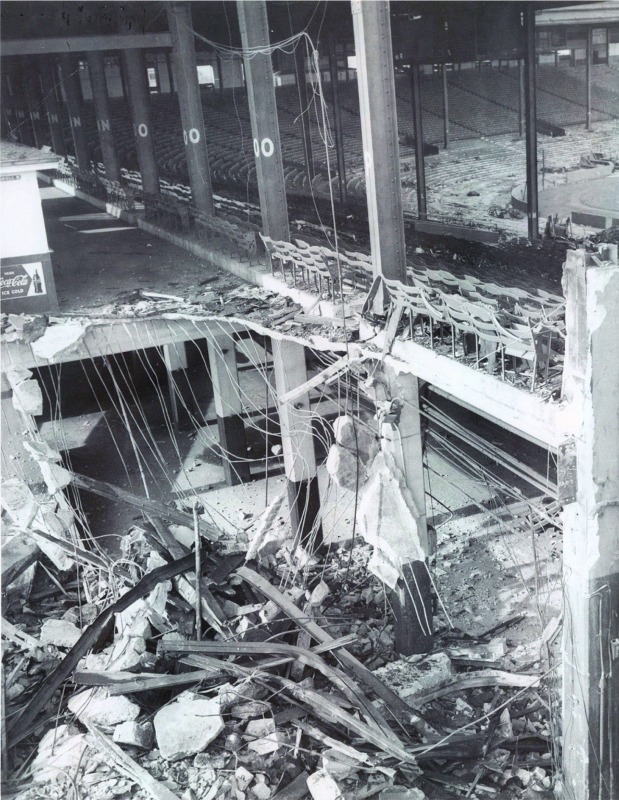 Most of the original stadium was demolished except for the right field stands and a long building that originally housed the ticket and executive offices. 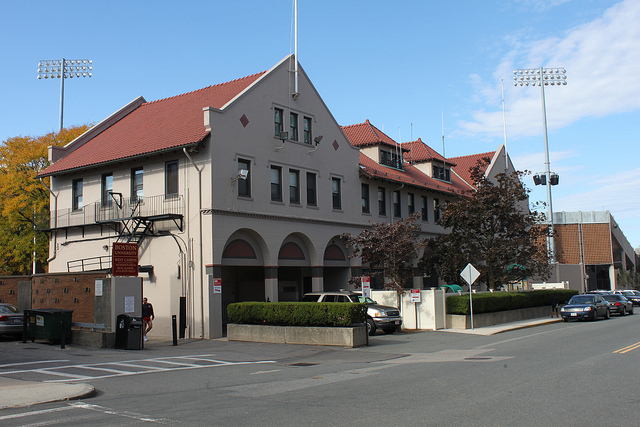 The stadium is known as Nickerson Field today and was home to the Boston University’s football team until 1997. 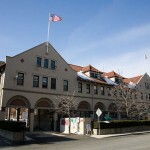 It currently is home to the university’s lacrosse and soccer programs.